In August of 2016, Israeli police officers arrested a Palestinian donkey in the Jordan Valley. The charge? Not having the correct paperwork. It’s an image as sad (and strangely common) as it is symbolic: No creature great or small is free from the absurdities of the Occupied Territories. Companions in Conflict is a surprising investigation into the deeply intertwined lives of the region’s human and animal populations: From camel beauty contests, to a herd of “illegal” Palestinian cows hunted down by Israeli soldiers; from a hyena in a wolf pack that becomes a symbol of Middle East peace, to the tragic story of the now-taxidermied inhabitants of the West Bank’s only zoo–who were frightened to death by Israeli explosive devices. 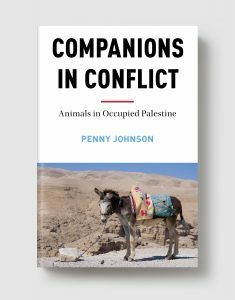 Drawing on three decades of living in the region, Penny Johnson’s insightful writing reveals what these and many other animals’ fates tell us about the current state of Israel and Palestine. What’s more, looking forward, she introduces a new generation of environmental activists to us, who represent the region’s best hope for conservation, collaboration, and justice for all creatures. Penny Johnson is a researcher and founding member of the Institute of Women’s Studies at Birzeit University in Palestine. She is also an editor of Jerusalem Quarterly and is a co-editor of and contributor to two acclaimed books of essays: Shifting Sands: The Unraveliling of the Old Order in the Middle East and Seeking Palestine, which won the Palestine Book Award. Born in America, she lives in Ramallah.